City of Mati in Davao Oriental was my Voyage Stop last weekend. The City of Mati is 165.6 kms. from Davao City. 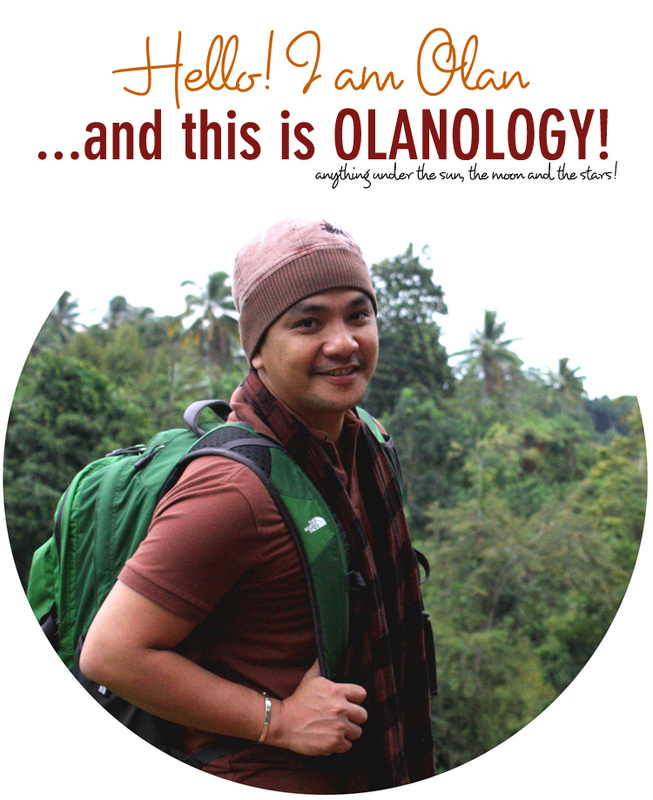 It is the capital town of Davao Oriental. I've been to this little new city for several times now. But it seems to me that there are more things to discover here every visit I've made. More things to experience. And more reasons to come back. Maybe, the City and its rich beauty is just so enchanting that every year I long to visit and savor its splendor. Thus, the next few posts will feature my Voyage along with my friends to the City of Mati. Being there last weekend, i realize that there are more to explore. More to tell. More to share. And MOST OF ALL, more to blog about it! LOL! DAHICAN BEACH - famous for its long stretch of white sand and its clean crystal clear blue-green waters facing the mighty Pacific Ocean. It is undeniably a perfect beach enticing adventurous people like me to experience a great thrill of skimboarding and kayaking. CINCO MASAO BEACH RESORT - is approximately 18 km from Mati Poblacion located at Sitio Dita, Barangay Bobon. It is resting stop overlooking Pujada Bay and is being secured w/ the railing that enhances the ambience of the beach. Gregorio-Dita White Sand Beach Resort - situated beside Cinco-Masao Beach Resort and home of Philippine Tarsier locally known as "Mago". One can see this Nocturnal creature face to face in captivity. BOTONA BEACH RESORT - Lies along the 7 kilometers stretch of the famous Dahican white sand beach. This 2 hectares fully fenced beach resort in Purok Maribujok, Dahican houses two (2) units European inspired rest houses where one can feel the comfort of home equipped with air-conditioned rooms with toilet and home entertainment facility. 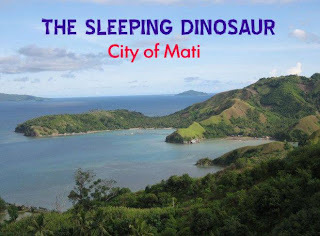 THE SLEEPING DINOSUAR - This natural attraction is approximately 579 hectares located at Sitio Baso of Barangay Badas.It is visible upon passing the eight (8) kilometers winding roads of Badas going to Mati from Davao City. GUANG GUANG MANGROVE PARK & NURSERY - The joint project of Guang-Guang Community and the DENR, serving as the habitat of Marine lives. This is a vast magrove forest of different mangrove trees of different varieties that provides a good spawning grounds for marine lives. These are among the few attractions me and my friends experience in this Charming City. But actually, it has more to offer and more to see!!! 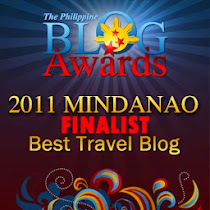 next posts will be more on Mati Adventures. Have you seen a beach resort in a mangrove swamp? Me? Yes, I do! On our way back to Davao from our One Fine Roadtrip Day, the town of Pantukan, Compostela Valley invited us to experience a hidden resort that nestled in an amazing mangrove swamp. The signage going to the place was just too tiny to be noticed but the place offered us a different sight of a hidden paradise situated in a little swampy mangrove forest. These mangroves definitely added beauty to the place. It made the place calm and serene. I felt it was like a solace for a weary heart. So calm and so tender. I remember the words i said when i stepped on its white sand. I said: "Nature, after all, are all beauties in different shapes, structures and places. So many beautiful words to describe! Just stunning!" These mangroves (generally) are trees and shrubs that grow in saline coastal habitats in the tropics and subtropics. These trees grow only in salty water. My friends and I enjoyed the whole Roadtrip. 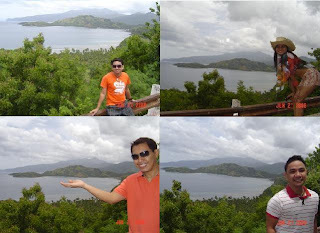 The sidetrip visit to Arancon Beach Resort was the highlight of the trip. Moreso, of course the place is the ideal venue for a great photo shoot. Different poses and different angles. One has to perfect the art of picture-perfect because the place itself is a picture-perfect! Maricar climbed a huge old magrove tree trying to project a perfect pose. Anna felt it was where she belonged. She seemed to be at home. Wendel just wanted not to miss the perfect view of the old huts behind him. Philip was awed by the scenic view making them all the ideal place to his signature smile. And this blogger on the other hand can't simply resist the calling of this gigantic roots that looked like beautiful art of nature. Generally, the road trip was truly a great getaway. And the Arancon Beach Resort is simply an irresistible place to explore and savor a different kind of beach experience.